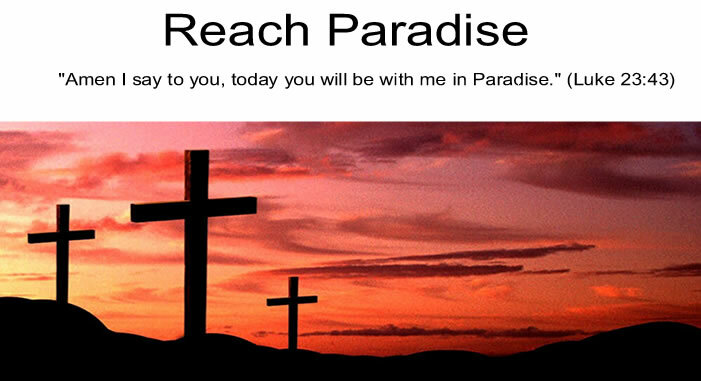 Reach Paradise: Ok, But Someday I'll Know Everything ... Right? 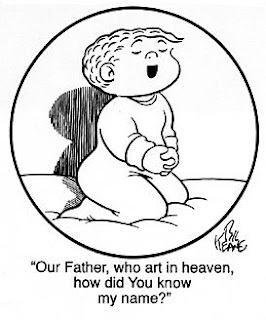 I remember when I was a little kid - like Billy in the comic - and started to learn all the right words to my prayers and the meaning behind the words we say at Mass. At this point in my life, I can (almost, sort of) confidently say that I use all the right words in my prayers. But I still constantly try to make our Mass more than just a bunch of repetitive words and actions - to find the meaning behind each action and every word. For example, during the Eucharistic Prayer and the Institution Narrative, I really try to picture Jesus present in front of us, and mentally walk through the sacrifices He made for us. Sure, I hit myself upside the head for not figuring that out sooner. But at the same time I smiled inside, knowing that in this circus of life, God reveals different things to all of us at different times. P.S. I'd love to know if any of you do anything like this to bring the Mass to life. As you can see, I can use all the help I can get! Great post, Michael. I have had those Billy moments myself. I firmly believe that we get what we get when we are ready to get it- if we remain open to God's grace to get it. From the early days of my reversion I have prayed the following short prayer before Mass begins and again right before the Consecration: "Lord Jesus, draw me more deeply into these Sacred Mysteries we are to celebrate." I too need all the help I can get in this area because I can become so easily distracted at times.
" ... God reveals different things to all of us at different times." I don't know what's going on here. I was on my Blog just now, responding to your comments there, and I happened to mention St John the Baptist. Then I visited your Blog and you too are talking of the same Saint ... Of all the Saints in Heaven above, what are the odds of both of us talking of the same one at the same time? God incidence? Like you, I didn't realize that those were the words of St. John the Baptist. How about the words we pray immediately afterward which are soon to be changed to the exact quote from scripture uttered by the centurion "Lord, I am not worthy that you should enter under my roof, but only say the word, and your servant shall be healed." Have you read "The Lamb's Supper" by Scott Hahn? It's fascinating! He compares the entire Mass to the book of Revelation, that our worship of God at Mass is what the angels in heaven say over and over again-"Holy, holy, holy!" One of the things I love about our faith is how things are revealed to us, layer by layer. I compare it to those Russian Kachina dolls, -you open up one, and there is another inside. I do what you do, Michael. I act as if I am physically present at the Last Supper with Jesus. I also ask Our Lady to help me put my whole heart into the Mass :) I ask her to prepare my heart for Communion and to share with me her own love for Jesus. Michael your posts are always such an inspiration. Mass for me is like stepping into a different world. It is so beautiful there. I try to think of things that Jesus may have felt. I like to think of his love for us. I like the peace I find there. I think as we grow older more and more things are revealed to us. I also think the more we seek the more we find. I hope your week has been going well. I love when this happens. For me, I have been thinking about how the Mass is outside of time. That is so powerful for me. To think that all that lived and will live are celebrating with us. Wow! Karinann: Love the short prayer! I will keep that one in mind. Victor: Wow! Sounds like a God-incidence to me. Especially since I don't think I've written about John the Baptist once since I started this blog! Anne: I haven't read that book, but will add it to my list, thanks. I enjoy his books, so I imagine this one is very good. Mary: Another good thought... thanks! Who better to give us that perspective than Our Blessed Mother? Carol: Thank you! I know what you mean - and I find it challenging to bring that different world outside Mass and into the real world. Andie: Outside time ... wow, that is deep. I like it. Very powerful thought. For me, when the Body of Christ is put in my hand I think of Christ physically touching my hand...and for that moment I am holding hands with Jesus.